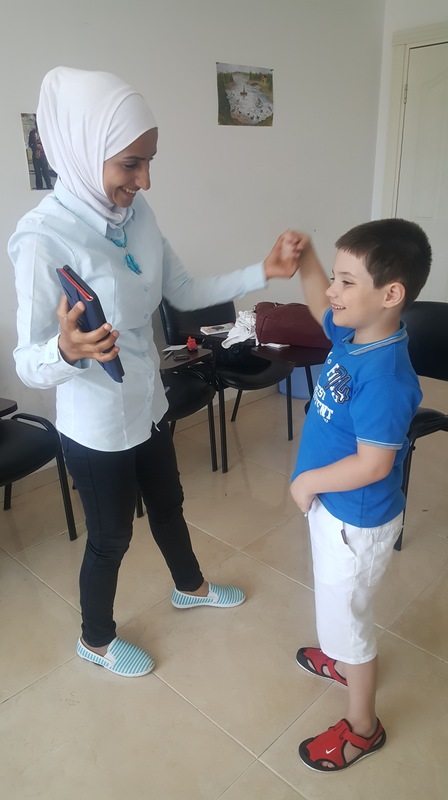 With the wrap-up of the in-person portion of our Mersin training program just around the corner, we want to take a moment to recognize the outstanding progress of a few of the children in our program. 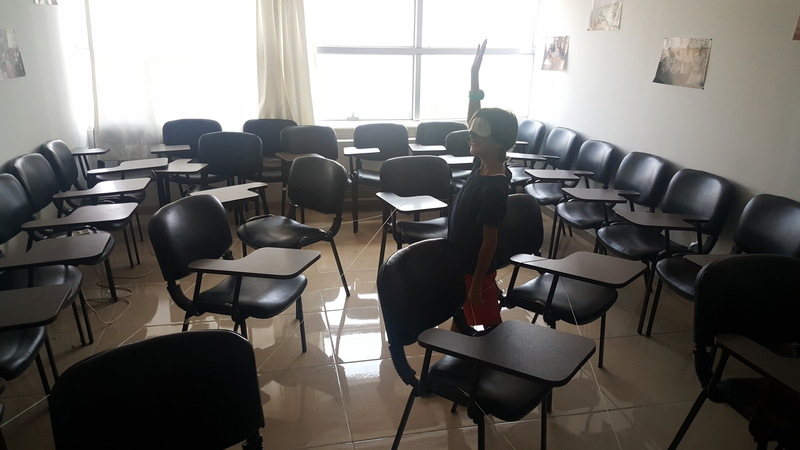 Over the past two and a half months, we’ve seen breakthroughs for every child, parent and teacher in our Mersin program. We know that we will continue to have more moments to celebrate in the coming months as the families move in to the online follow-up portion of the program. Here are some highlights from a few of our determined learners! Known For: Being the most organized member of the A Global Voice for Autism community. If there’s a mess in sight, we can always count on Haya to clean it up! Progress Highlights: When Haya first joined us she was primarily communicating by guiding her mother to the things she wanted. Now, Haya is using vocal approximations of one to two words to ask for the things she wants! Haya also has out-of-this-world receptive language skills. She can imitate almost any gross motor skills and quickly learns to label new objects independently. 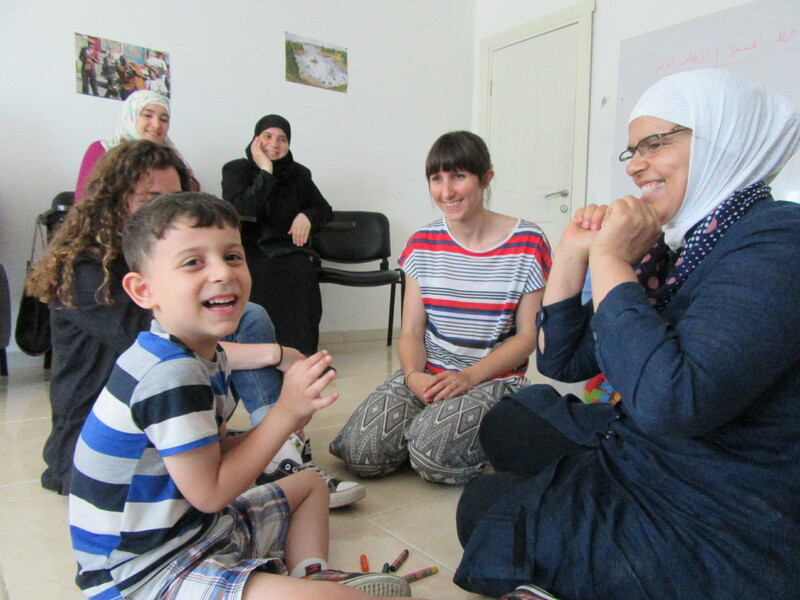 At the beginning of the program, Haya’s mother never felt comfortable taking her on community outings. After some hard work from both Haya and her mother, Haya’s mother sometimes feels comfortable taking her out into the community! 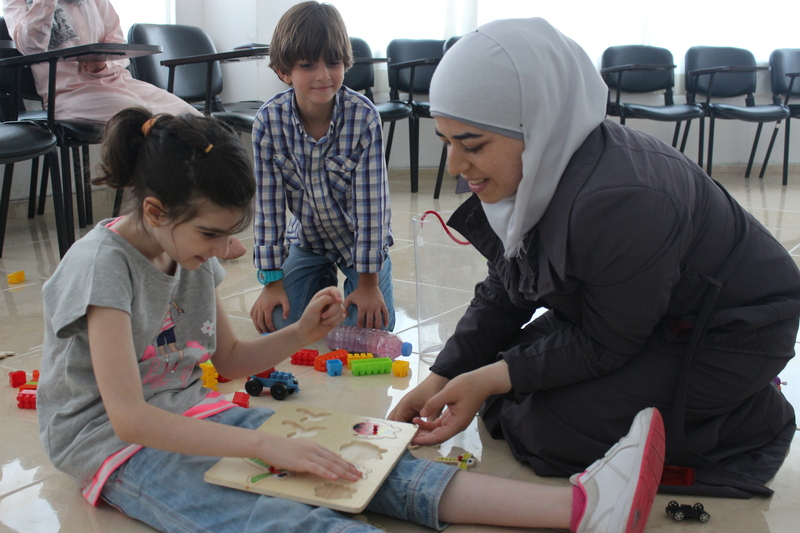 Known For: Being the best English speaker out of all of the parents, children and siblings at our Mersin program site. Ali teaches himself English on Youtube! Progress Highlights: At the beginning of the program, we couldn’t get Ali out of his mother’s lap to play with another parent or teacher. 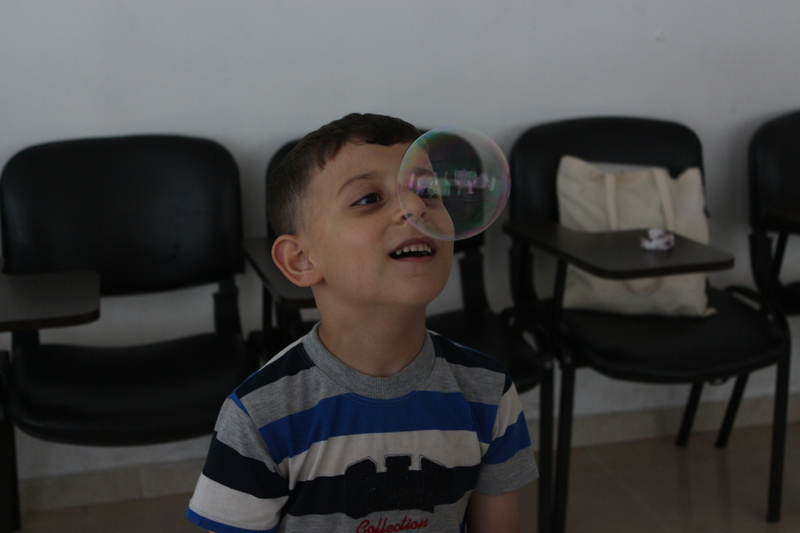 Now, Ali happily joins his teachers and the other parents in the program to learn new skills, get tickled, play games and blow bubbles. 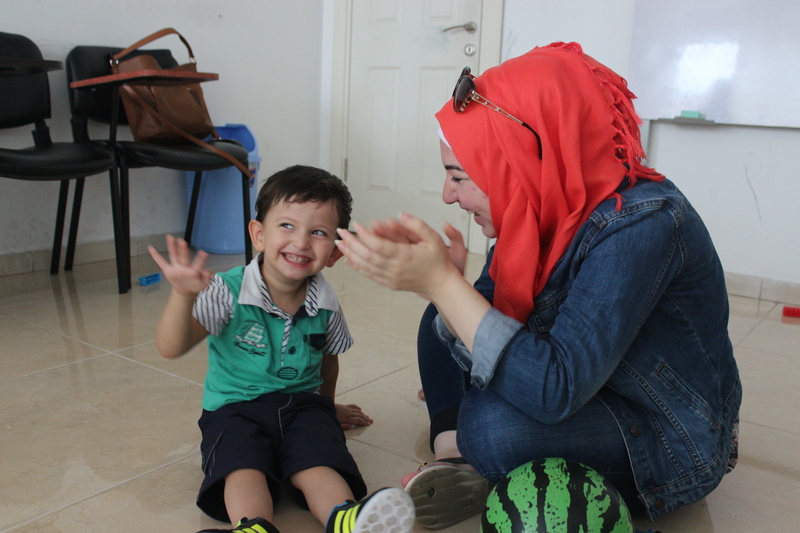 Ali has also learned to interact with his peers in play, which his mother said he never did prior to the program. Ali has made so much progress in this area that he is even going to have a playdate with Reema in the coming weeks! Known For: Melting our hearts with his contagious smiles and enthusiastic hugs. Progress Highlights: For the first time in his life, Amjed is pointing to ask for what he wants instead of crying or dragging his mother to it. At the beginning of the program he was not making sounds, and he’s even started making some vocal approximations! One of the things we worked on with the kids this week was motor imitation. In Amjed’s session, he did few independent imitations with his teacher, Rana G, who reinforced these imitations with lots of hugs and praise. Also, Ali did a great job today imitating simple moves with minimal help from his teacher and his mother. Another thing we worked on was labeling or naming items with Reema and Haya. Both of them did an excellent job trying to produce vocal approximations and sometimes echo the whole word. Also, when using pictures, both of them liked to collect each picture and put them back in the small bag as a reinforcer. Our teachers this week were awesome, as usual. 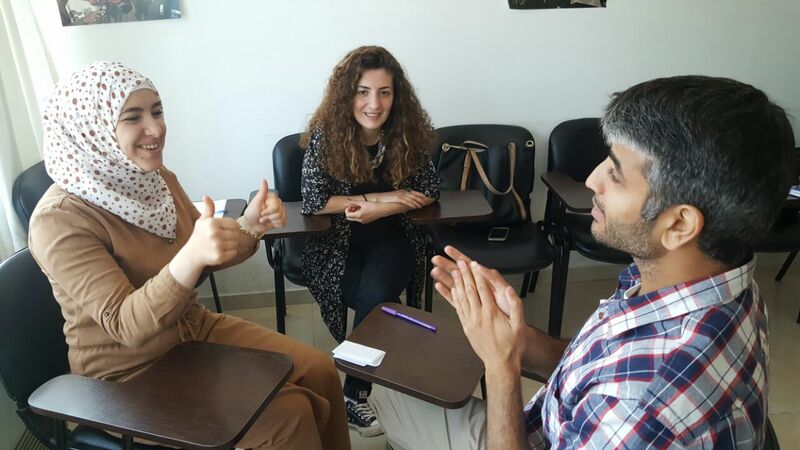 Fouza today was very enthusiastic during the role-play and managed to work on several skills at the same time by interspersing the trials. Rula did a great job catching Haya’s motivation to teach her labeling and imitation. We also need to recognize our amazing parents who have been working with their children at home and sharing stories, videos and pictures for their children with us. Giving more learning opportunities at home helps the children to master the skills they are working on. 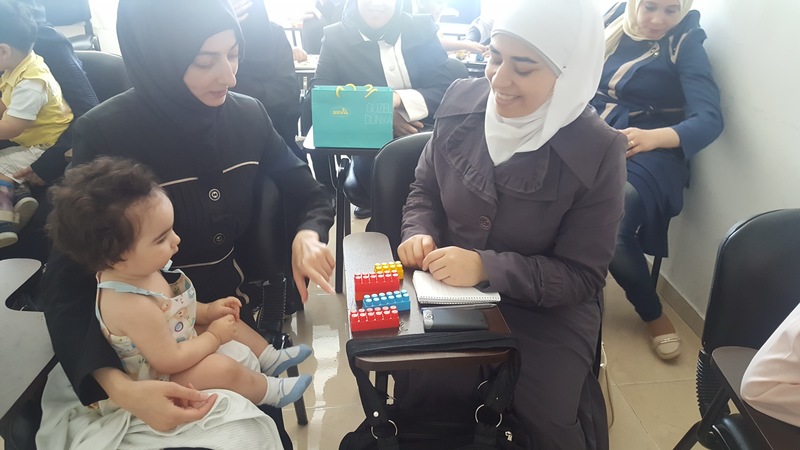 Therefore, the parents this week were very excited to arrange a play date together to give their children more learning opportunities with other children. What are the most valuable things you have learned in the program so far? I’ve learned that details and small things matter when it comes to setting up situations where children with autism can learn from me. Some of these small things are counterintuitive for me but when I use them in my teaching, they make a big difference. I’ve started to be more focused and to pay attention to everything I do because every movement can make a difference for a child. How have you been able to (or how do you anticipate that you will be able to) use these skills in your classroom? For the first time, I feel motivated to work with these children and to include them in my classroom. I pay more attention to the details. I used to think that there was a wall between myself and children with autism, but the more I practice and the more I learn, the more this wall is disappearing. Would you recommend this program to other teachers? Why? I would recommend it very strongly. I wish that all teachers could go through this training because it will help them in their teaching and with their students. There isn’t a teacher I’ve met to whom I wouldn’t recommend that they come to this training. We have a lot of teachers who care about childhood, parenting and early childhood education. Will you start advocating for more children with autism to attend your school? I already talked to the school management and told them that we are learning how to support children with autism and that we should accept them and include them in the school. I told them that it is not as hard as they think it is to include children with autism. They won’t harm the school and will really benefit from being included with typically developing students. The other teachers and I are already advocating for this. For me this morning was one of the highlights of the entire programme. We went with Amjed and his parents for a community outing to the barbers. 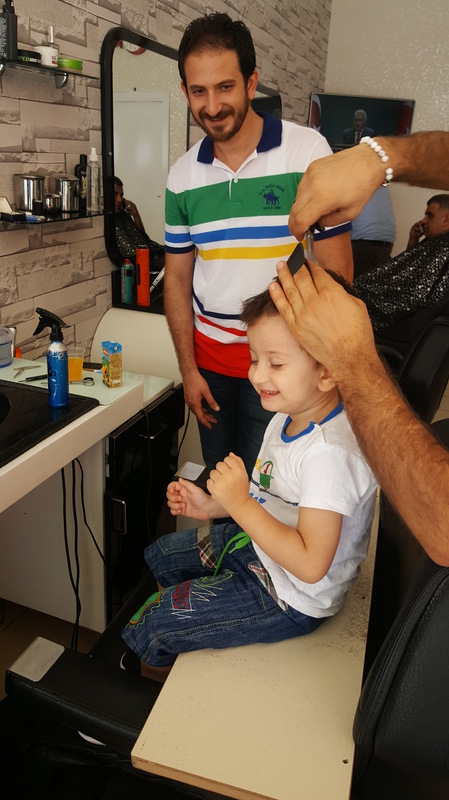 His parents have been having difficulty cutting his hair and they reported that on previous visits the he would not tolerate sitting in the chair, they had had to hold him still in order to cut his hair, that he was always crying and screaming. We coached them through some strategies, provided advice and answered their questions. 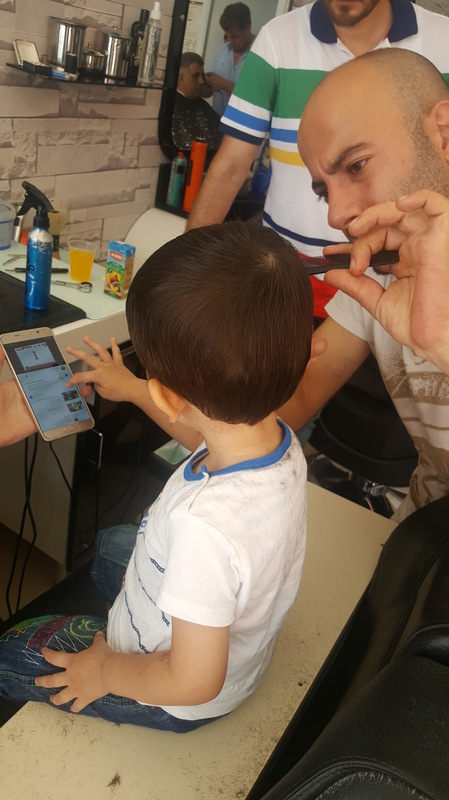 Amjed was very motivated by watching videos on his mother’s phone and we made this contingent on sitting and having his hair cut. This means that whenever he was sitting in the barber’s chair and allowing his hair to be touched or cut he was able to watch the video, but if he started screaming or crying, or pushing the barber away then the video was removed. This worked really well and Amjed was able to leave with a very smart haircut. His dad told us that this was the first time that he had ever seen him sitting so calmly to have his hair cut. 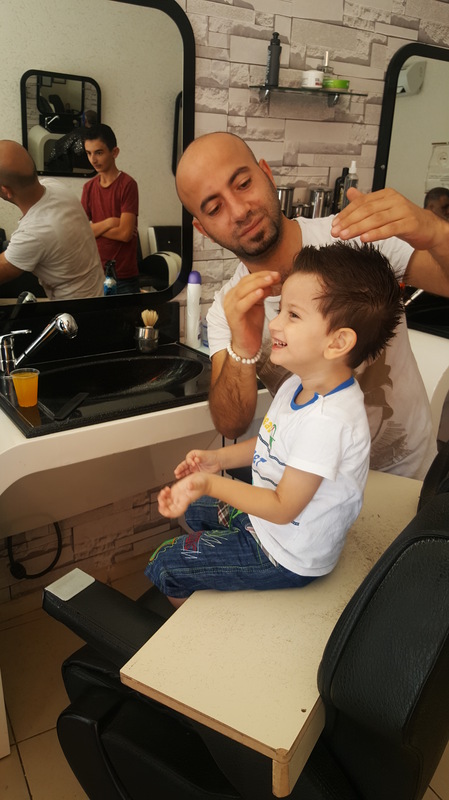 The barber was also very pleased and told us that he was going to use these strategies with some other children who come to him for haircuts. He even started to get carried away by wanting to blow dry and style Amjed’s hair! We had to remind everyone to take small steps and make sure to finish on a positive note rather than pushing Amjed too much at once. This afternoon we had a support group with parents and siblings of children with autism, and did some really nice activities with them. Everyone shared a story about when they had seen their child/sibling with autism ‘at their best’. Some of our favourites were Haya knowing without direct teaching to put the correct pillow and blanket on the bed of each member of her family, and Ali starting to count in English when he saw the numbers on his sister’s watch. Everyone then shared a time when they’d seen others in the group at their best, and we had some really touching (and a few funny) observations that people had made about each other. The parents spoke about times when they’d seen each other being sweet, optimistic, smart and organised, and all of them mentioned about how they feel that they have gained close friends from this group. This morning, we planned for a long training session with our families and teachers. The session today included our usual training, in which we covered toilet training. In addition to that, we had Melissa, who is currently traveling, Skyping us to talk about inclusive education and our follow-up program. Sarah, our amazing lead BCBA, was so creative in creating an activity for parents and teachers today to practice the skills we covered during the session. After covering most of the applied procedure for toilet training, Sarah asked the parents and teachers to split up into pairs, a teacher and a child, and gave each pair a bottle of water and asked them to imagine that this bottle is the child’s bladder. Holding the bottle upside down means that the child has used the bathroom. Also, one part of the activity was to have the child choose a strong reinforcer using a simple and a quick preference assessment to use it to reinforce successful trials. Parents and teachers enjoyed the activity, and wished that the real-life practice with a child could be as easy and fun as this practice! After that, Melissa started a conversation about inclusive education via Skype. She discussed some statistics and studies that showed several positive impacts of inclusion on children with disabilities as well as their typically developing peers. The session was very interactive; parents and teachers were enthusiastic to share their thoughts and comments about the benefits of inclusion. Also, Melissa talked about the importance of advocating for inclusion, and gave the teachers an assignment to advocate for inclusion in their schools or other schools by planning a meeting with someone who has the authority in their community to make the decision of including children with disabilities in regular education classrooms. Teachers were given the choice to work on this assignment individually or as a group. They also brainstormed some ways and some people they can reach out to. Towards the end of the session, Melissa discussed some points about the virtual follow-up program we offer for families and teachers for a year after the program is done. The main part of this program requires parents and teachers to send our team a 3 to 5 minute videos, either in the classroom setting or home setting, to take our team’s feedback on it and continue to improve their skills in teaching children with autism. After we finished the session, we came back to our apartment to take a quick break and start planning for tomorrow’s community outing and support sessions. 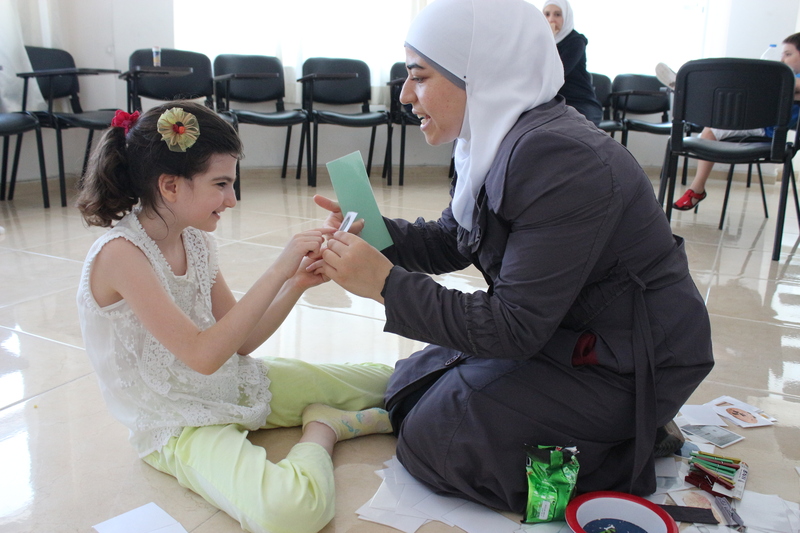 Roaa pretends to be a child in a modeling trial with Qiess at a cooperative session. The most important thing I learned was direct reinforcement. Some parents or teachers think that if a child does a skill it’s amazing but they didn’t think about how they can maintain it for the future. This training taught me that I can use reinforcement to maintain behavior for the future. How has your perception of autism changed since starting this program? I already had this view that all children can learn including children with autism, maybe because I had some experience working with children with disabilities like my brother. One child with autism moved from my brother’s school to a mainstream school and took the first honor. Although society feels sorry for people with autism and thinks they cannot learn, I have seen their progress and know their potential, like how quickly Hani picked up on 4 word requests. What is a personal goal you have for the rest of the program? I was really looking forward to this program because a lot of children who suffered from the war have psychological problems. I want to learn as many skills as possible to support these children. Not only is it related to a population that I might work with, but they might be skills I can use to help my friends and neighbors. In Syria a child with autism came to me with chemical burns all over his body. When I was trying to help him with his burns and injuries I had to figure out what to do and how to communicate with him so that I could help him get what he needed. I really wish that all teachers could participate in this program because many teachers don’t understand how to motivate and support children. I’ve seen teachers tell kids they are stupid to get the kids motivated rather than encouraging them. A lot of teachers here have fake certificates so they don’t know how to help any children well. 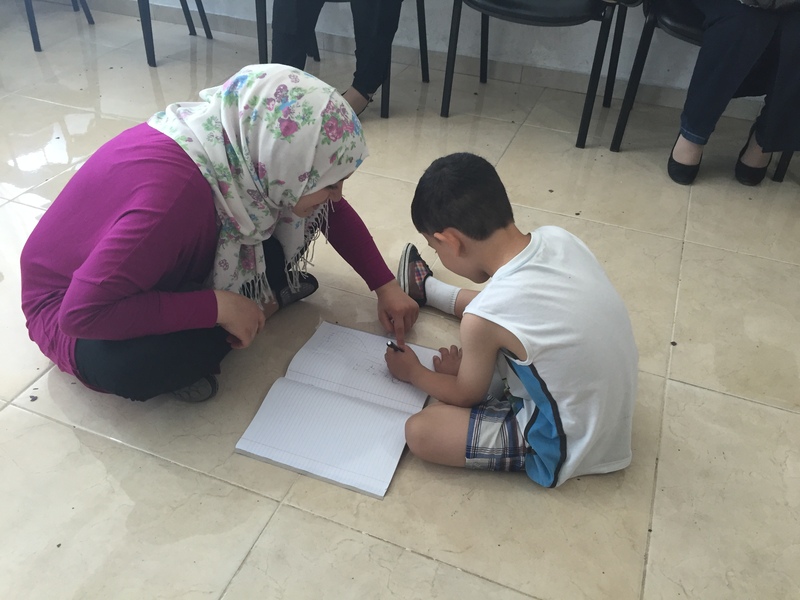 This program can give them strategies so that they can better support all children. This week has passed in a flurry of activity and we have had fabulous successes with our cooperative groups again. Following our training this week we worked on some new skills as well as continuing to build on progress from previous sessions. With Amjed we continued to work on receptive understanding in the form of identifying common objects and it’s brilliant to see him becoming more independent with these. We also started working on basic motor imitation, which is important for play skills. Some of the feedback we gave included ensuring that he is attending to the teacher prior to giving an instruction or modelling something for him to copy. Following on from last week Amjed is now reliably making a vocalisation with his gestured requests, and some of these vocalisations are starting to sound more like the name of the item that he is requesting. This is fantastic progress and it was so great to see! 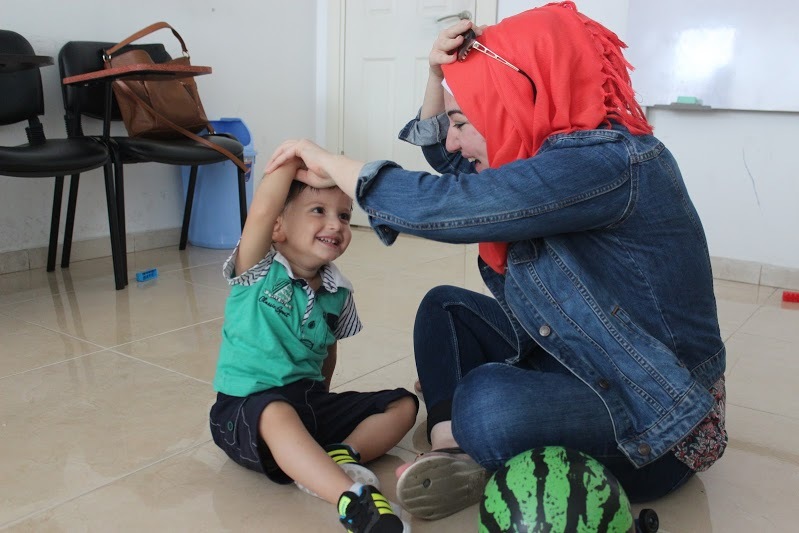 Haya was able to copy gross motor actions such as waving her arms, raising her legs and jumping. She found it harder to copy fine motor actions (such as moving just one finger) and copying an action with an object. It was great to reflect on how far she has come since our first sessions with her. She is able to tolerate following instructions from her mother and teachers much more now and this means that they can provide many more opportunities for learning. 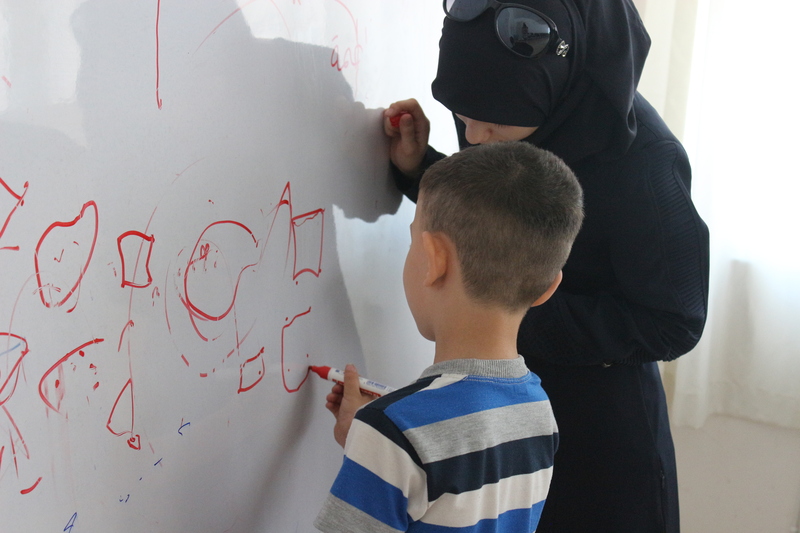 Reema’s brother came to the cooperative session this week and he was excited to see what his sister has been learning and how his mother and teachers are working with her. We challenged the group to lead their own session and they did a super job of coaching each other and discussing teaching strategies together. A particular priority for Hani’s mother is that he speaks more quietly; often when he makes a request he shouts this very loudly. We focussed on providing reinforcement (he was particularly motivated by the bubbles and a ball) only when he made a request at a conversational volume and he was able to start doing this very quickly when his mother was consistent with her responses. After another great week we had so many photos to choose between, we hope you enjoys the ones we’ve chosen to share! After the activity, the families were discussing how difficult it is to find affordable housing options for Syrians in Mersin. They reported that the apartment rental are always higher for Syrians than Turkish people. Lama, who was looking for a new apartment, stated that the owners of the apartments increase the rent annually for all Syrians for no logical reason. The conversation went on about the different ways that Syrian refugees are discriminated against. Muna reported an incident that happened with her when she was on the bus yesterday. She said: “There was a woman in the bus yesterday staring at me and making very rude comments. I did not understand what she said because it was in Turkish, but my daughter [who learned Turkish] told me that she was calling us cows and bulls. I was very angry but I could not do anything!” According to Muna, the driver of the bus stopped and asked to woman to go down because he thought this is not how Turkish people should treat others. However, Muna said “I know that there are some good people around, but I am afraid that someone would chase me or my children, so I always ask my daughters to speak Turkish when they are outside”, she added: “I might start thinking about putting my hijab in a Turkish way so others would think that I am Turkish not Syrian”. It is sad that the Syrian refugee community is still facing struggles by being discriminated against instead of finding support, even though some of them have been living in Turkey for more than 3 years. 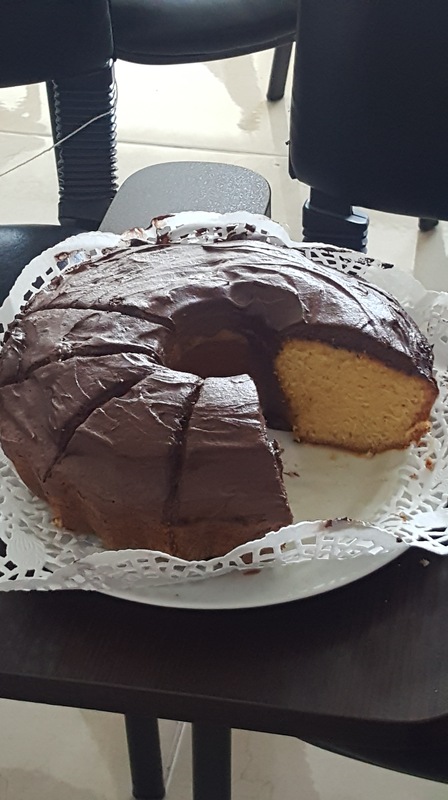 After this long discussion, Lama helped us ending the session on a positive note by surprising us with a homemade chocolate cake to have a small celebration for her youngest daughter, who is turning one tomorrow. Thank you, Lama! And happy birthday to your little pumpkin! Today we had a busy day as we combined our training session with doing a review of the programme. The review involved asking parents and teachers to complete various questionnaires and interviews that they had also completed at the very beginning of the programme. We filmed some of the interviews and got some great feedback. Our training was on play and social skills and how we can teach these skills to children with autism. We started by discussing how children typically develop play and social skills and how they move through various stages of development. For example, children initially play alone and then begin to play in parallel with a peer, and later learn to cooperate with another child to achieve a common goal. Next we discussed how play and social skills can be difficult for children with autism, for example, they may not acquire imitation skills that are important for play without specific teaching, and they might experience difficulties with understanding the feelings and thoughts of others, which can make social interactions harder. We talked about specific teaching strategies that can be used with children with autism and these included how to teach imitation with objects, breaking play skills down into smaller steps to help us teach them and using video models. As usual our families and teachers were very willing to have a go themselves and practised some of the strategies with each other. We’re looking forward to having further opportunities to practise in our cooperative sessions this week. Today we had a make-up training session for some of our teachers who could not attend the session on Monday. The session was in the late afternoon, which gave us some time in the morning to work on planning, preparing and translating other trainings. Sarah did an excellent job prioritizing the information and tailoring it to the teachers who specifically work in the school setting. The teachers also came up with great examples on how to apply the strategies in the school setting. One example a teacher gave was on how she uses the different types of prompts to teach students how write the Arabic alphabet, and how she sometimes combines two types of prompts and gradually fades these in later lessons. Different demonstrations were given throughout the presentation about specific concepts like forward chaining and backward chaining to make it easier for the teachers to grasp it. At the end of the session, we gave the teachers a small homework. We asked them, using the strategies we covered, to write some goals they would want their students to achieve. Also, we asked each of them to write a task analysis for a complex classroom skill. We will be reviewing and giving feedback on this homework during the next week. 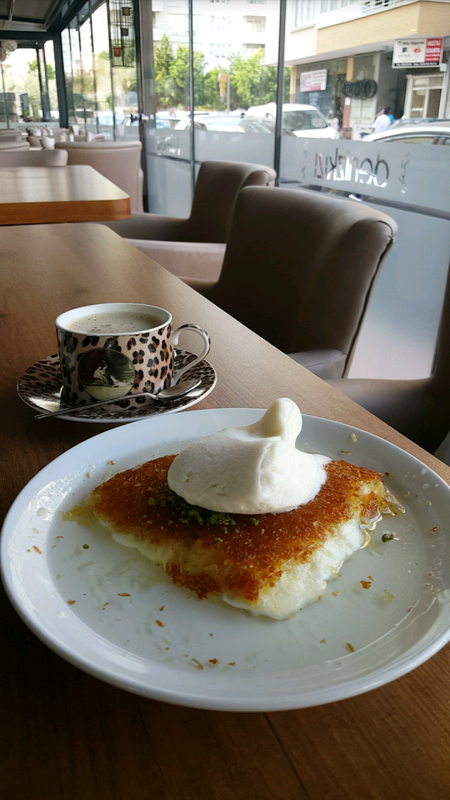 After leaving the center, we decided to stop by a café near our apartment to continue our work there while having some coffee and Kunefe.